By forcing water through a small nozzle under high pressure at 10-50 kg/cm2 parenchymatous tissue can be removed, whereas vessels >200 ^m in diameter remain undamaged (2). This tissue skeletonization by water-jet facilitates subsequent hemostasis by elec-trocautery or suturing and is being utilized clinically, such as for partial hepatectomy or nephrectomy. Structures up to diameter of ~500 ^m can be dissected by using probes generated to longitudinal and transverse oscillation of 200-300 ^m by ultrasound in the 20-50 kHz range. By combining mechanical tissue fragmentation with thermal sealing of larger vessels with the heat generated during the tissue fragmentation process, ultrasound dissectors permit blood-free dissection of even heavily vascularized structures, and have become standard surgical equipment today (2-9). Both techniques, however, can only be utilized upon contact, and not by an extracorporeal approach. A number of in vitro and in vivo experimental studies with the electromagnetic and electrohydraulic shock-wave sources used for lithotripsy have documented shock-wave-induced cellular damage in the focal area, but the microenvironments of the cells treated impact significantly on the shock-wave effect. If tumor cells in suspension are treated, the effect is significantly more pronounced than when the same type and number of cells are immobilized in gelatine. In vivo studies on more complex in vivo models with implanted tumors have yet failed to define structured effects of shock waves as used in lithotripsy other than hemorrhage and signs of mechanical tissue dissipation. FIGURE 1 ■ Profile of extracorporeal shock wave as used for lithotripsy; the negative pressure phase results in cavitation bubble formation. Source: From Ref. 12.
for extracorporeal tissue ablation. The relatively weak acoustic shock waves used for lithotripsy exert both positive and negative pressures up to 100 and 10 Mpa, respectively (11). 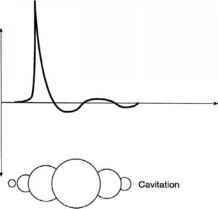 Especially, the latter are sufficient to cause cavitation from liquid failure at numerous sites near the focus. As the liquid fails, the vapor-filled cavities that are initially developed collapse with enormous force (Fig. 1). Asymmetric high-speed liquid microjets with velocities of 130-170 m/sec are generated at their surface, which are considered to be the primary mechanisms for stone disintegration and also for trauma to the soft tissue surrounding (3,13). Because of the high speed of the bubble breakdown there is virtually no temperature rise within the focus (14). Homolytic cleavage of molecules may also result in free radical formation, and this has been speculated to result in an additional focal tumoricidal effect (15,16). A number of in vitro and in vivo experimental studies with the electromagnetic and electrohydraulic shock-wave sources used for lithotripsy have documented shockwave-induced cellular damage in the focal area (17-19), but the microenvironments of the cells treated impact significantly on the shock-wave effect. If tumor cells in suspension are treated, the effect is significantly more pronounced than when the same type and number of cells are immobilized in gelatine (20-23). Clearly, secondary physical effects such as microjet formations, blast effects, compressions, and tensile stress factors also play major roles in cellular damage. Similar studies have also shown a potentiating effect of shock waves on cytotoxic agents such as cisplatin, vinblastin, doxorubicin or 4-hydroperoxycyclosphoride and cytokines (24-28). The effect diminishes rapidly after shock-wave exposure, suggesting transient increases in cell membrane permeability as a result of direct mechanical damage of cellular structures being the main mechanism involved. Clearly, single cell suspension models are simply insufficient to study cytotoxic shock-wave effects. In vivo studies on more complex in vivo models with implanted tumors have yet failed to define structured effects of shock waves as used in lithotripsy other than hemorrhage and signs of mechanical tissue dissipation (18,28-31). Tissue cavitation within the focal zone can be augmented by increasing the negative pressure of the shock wave, but more effectively by increasing the frequency of shock waves generated to more than 10 exposures per second (i.e., >10 Hz) (Fig. 2). 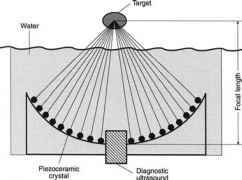 By using ultrasound shock waves generated from piezoceramic elements mounted on a concave disk and focused to a joint focus (Fig. 3), both high frequencies and site intensities can be obtained, which result in immediate cellular disruption within the focus. This technique has been defined as "high-energy shock wave" tissue tripsy or "pyrotherapy" and has received considerable experimental and phase II clinical attention (32-35). Vallancien's group (32) described an extracorporeal apparatus for in-depth tissue ablation based on this mechanism. The system is an adaptation of a lithotripter (Pyrotech ). The energy source consists of multiple transducer elements and has a focal length of 15 cm. The site intensity has been quoted to exceed 10,000 W/cm2, but precise data are not available. A 3.5 MHz sectorial imaging transducer with a focal length of 14 cm is positioned in the center of the therapy elements. The focal area is 10 mm high X 2 mm wide for 50% power at —6 dB. The energy source head is positioned in a large bag of cavi-tation-free water below a waterproof membrane in the middle of a treatment bed (Fig. 3). During high-energy shock wave, the bubble formation with the focal zone increases progressively; these bubbles subsequently collapse rapidly. This rapid collapse compresses the gas inside the bubble without heat exchange with the surrounding tissue and results in a local temperature increase. Therefore, high-energy shock wave is considered to make use of both the mechanical and more limited, the thermal effects of ultrasound. This extracor-poreal device has been tested under numerous experimental conditions, and preliminary human trials involving prostate, kidney, and bladder pathology have been reported. aEDAP, Vaulx en Velin, France. FIGURE2 ■ Cavitation processes within the focal zone are augmented by increasing the negative pressure of the shock wave and by increasing shock wave generation beyond 10 HA, so that the next shock wave hits the focal zone before the cavitation bubbles generated by the previous shock wave have fully collapsed. Source: From Ref. 12. FIGURE3 ■ Schematic depiction of system for extracorporeal high-energy tissue tripsy: ultrasound shock waves are generated at high frequency from multiple piezoceramic elements focused to a joint focus. A cushion filled with gas-free water serves for air-free coupling of the shock waves to the skin. Source: From Ref. 32. Although the majority of these studies yielded encouraging data, high-energy shock wave has not been introduced into broader clinical use for oncologic indications to date. This is mainly attributable to insufficient tumor targeting and the fact that cell damage from high-energy shock wave is mediated primarily via the mechanical effects of ultrasound (i.e., tissue cavitation), which is difficult to target, control, and predict. Reliable destruction of deep lying tissues (a prerequisite for use in oncologic indications) is hard to achieve with current high-energy shock wave devices. Vallancien and colleagues (32) studied sequential histologic effects of high-energy shock wave on 110 kidneys of white landrace pigs. Immediately after treatment, a high area of congestion with hemorrhage and exudation was present. After 24 hours, coagu-lative necrosis appeared. On day 7, the target area was completely necrotic, and at day 90, fibrotic scarring was seen in the treated area. In humans, the histologic impact of extracorporeal ultrasonic tissue tripsy on renal tissue was also studied (33). Patients with renal cancer (n = 5), renal atrophy (n = 2), or complex stones (n = 1) were subjected to extracorporeal ultrasonic tissue tripsy prior to nephrectomy. The treated volume averaged 4 cm3, the mean number of shots was 195, and the skin-focal point distance averaged 68 mm. Immediately after the procedure, treated areas showed intense congestion with severe hyperemia and marked alterations of microcapillaries. The results were identical to those observed in the porcine kidney. After 48 hours, early signs of limited subcapsular necrosis with a persistent zone of hyperemia were detected. Side effects were moderate: two patients noticed skin burns, but otherwise, no significant adverse effects were seen. The high-energy shock wave method has also been applied to ablate prostatic tissue. Although intraprostatic coagulative necrosis was demonstrable, the transabdominal approach proved to be poorly suited because the bony pelvis shields the prostate. Vallancien and colleagues could target the prostate adequately in only 50% of cases. The Pyrotech device has also been used to treat superficial bladder tumors. After an experimental study, a phase I/II clinical trial was initiated (34,35). In the first series, five patients with single recurrent superficial bladder tumor were treated immediately prior to transurethral resection. In all five cases, a change in the appearance of the tumor was noted. In two cases, the tumor was completely destroyed and histology showed coagulative necrosis. In a subsequent phase II trial, 20 patients with superficial bladder tumors were treated with this technique. Of these, 15 (75%) had normal urinary cytology results and cystoscopy at one month. In 67% of the patients with a primary tumor, there was no recurrence at one year; the remaining 33% developed recurrent tumors (35). In phase II clinical studies with HESWL, no tumor progression or occurrence of metastases was observed during follow-up of 3-21 months (33,35). Nevertheless, the risk of cell dissemination appears to remain an inherent problem of tumor destruction based primarily on mechanical forces. Although some authors have specifically studied this aspect and observed no enhancement of tumor metastases (31,36,37), there remains a cause for concern for the clinical application of high-energy shock wave to treat malignant tumors. Moreover, systems with multiple transducers targeting a joint focal area have proven difficult to focus in clinical practice.